Wake kids, dress kids, feed kids, clean up kids’ mess on floor, clean up kids mess on kids, dress kids again, shower, choose tie, convince wife that tie does match outfit, dress self, feed self, clean mess on tie, load car, screech out driveway only 3 minutes late this week, return for kids’ juice cups, screech out driveway again, 7 mins late this week. Still better than last week. Discuss tie choice on the drive. Struggle to be patient with clamor from kids, taxi drivers, broken traffic light, no parking in church lot; ignore dirty look from usher who saw you park in the handicapped spot, humbly accept that your pew is taken, remember that you forgot the overdue church library book, the sound is too soft so you move forward where it’s too loud. You missed the opening song (your favorite), but you were just in time for your three least favorite hymns. After you wrangle your thoughts away from whether or not you turned off the iron, the stove, and the curling iron, and after you stop imagining your house burning down, you start drifting into a light doze as the movie you watched til midnight last night plays in your brain. After a few elbow jabs from your spouse, you catch the last point of the sermon about how you should pray more. The sermon ends you greet the pastor who says, “Good to see you again, it’s been a while, have you been away?” You resist pointing out that you haven’t missed a service in three weeks, because deep down you know that although you were there in body, you really did miss the service every week since you had kids. Take heart. You are not alone. This is the frenetic milieu of every suburban churchgoer. I’m not sure what the solution is, or if there is one at all. But there are some practical preparations you can do to ameliorate the experience somewhat. 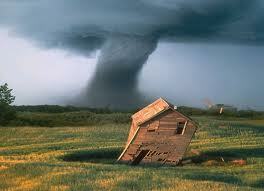 What makes tornadoes so devastating is if you are unprepared for them. If you get some warning, you can batten down the hatches, get under ground, and ride out the storm. If you are caught off-guard, you get swept up in the clutches of the chaos. It’s the same for Sundays. You know what’s coming, so get your house in order before it hits. 1. Make it a habit to be home on Saturday night. Lay out the kids’ clothes, set the breakfast table, decide what you will wear, write the offering check, load the stroller in the car, pack the diaper bag. These little chores amass like hordes of little time-eating gremlins, to gnaw at your efficiency. Sunday is war, and every minute counts. Use Saturday as an accomplice to ensure success on Sunday. 3. Sleep well and Eat well. If you got o bed at reasonable time instead of watching Seinfeld reruns until midnight; and if eat a hearty breakfast instead swallowing a pop-tart whole on the way out the door, then your body will work with your mind (or at least not be a saboteur) as you listen to the sermon. I have seen people fall asleep while I was preaching. I usually start to pound the pulpit and preach louder– not because I’m admitting I was lagging in zeal before, but because I’m attempting to rouse the comatose. 4. Work hard at helping one another get ready. The family is a team. Any problem that comes up (spilt milk on the floor, or dress) is a temptation to get frustrated and angry at a particular family member. This causes tension and tears and makes for a tense drive and unproductive worship time. Rather view everything “bad” that happens on Sunday as Satan’s devices to trip you up. Your holiness is more important than your punctuality. If you get to church late, but in the right frame of mind to worship and learn, you will have won the battle. If you get there on time but sinning in your heart, angry at your wife, with a teary toddler… your Sunday service has been forfeited. If you have any other suggestions, I’m sure the readers would appreciate hearing from you in the comments section below. I must say that our family is guilty of this Sunday 'tornado' ritual, and have prayed to be more committed to being at church (and at church on time )as a resolution for this new year. We don't watch much TV or go out much; however, we can relate to many of the points within this article.